For the newborn, it is always recommended to go for only breastfeeding. They are not allowed to intake anything other than breastmilk. Only breast milk serves the purpose properly and it contains all the required nutrients. The most important thing that you should keep in mind as a new parent is that you are giving the best possible care to your baby and feeding is the most important of all. I have been exclusively breast pumping for almost two months now since my son is at the NICU so I need to freeze my milk. After doing some research I concluded that the Honeysuckle bags were the most bang for my buck while being of quality. However, they can get expensive for those who have to exclusively pump like myself. So last week after I noticed I was running out of the Honeysuckle bags I decided to give Lansinoh a try since they are amazons top rated breastmilk storage bag. After I received them I immediately wanted to return. I was not pleased with the bags when I compared them to the Honeysuckle bags. So 2 days ago I logged on to Amazon to do a return. Turns out that they gave me an option to exchange them for the new and improved bags! The edges are now wider and the bag seems thicker! I am so glad lansinoh listened to its customers who had complained about the milk leaking because the edges were too small. I feel that everyone who left a bad review should give these bags another chance now that they have improve them. They are honesty the best quality for the price. I will no longer be purchansing the more expensing Honeysuckle bags because the new lansinoh bags are just as well made if not better! Thank you thank you! ​I was running out of milk storage bags and went ahead to order a new box. ​This was the first time I had seen the newly updated version. ​I had one of each, the ​older + latest version ​so I decided to take some side by side photos.​Clear Storage Bag:The new bags look like they have a reinforced seam.​ This is a plus - some of my old bags would leak. The perforations at the opening are different. I thought it was multiple pieces to rip off - but it actually tears off as one piece. It also sticks a little more than the older version so there's slightly more effort to get them open but not a big deal here. The bag can stand on its own if it has enough milk contained inside.​W​hite Dispenser bag:I like to use the dispenser bags because it keeps the actual storage bags clean and dust free. The new dispenser bags don't have the slit down the middle which I started to enjoy with the older bags - rather than opening/sealing the ​entire bag down the side. 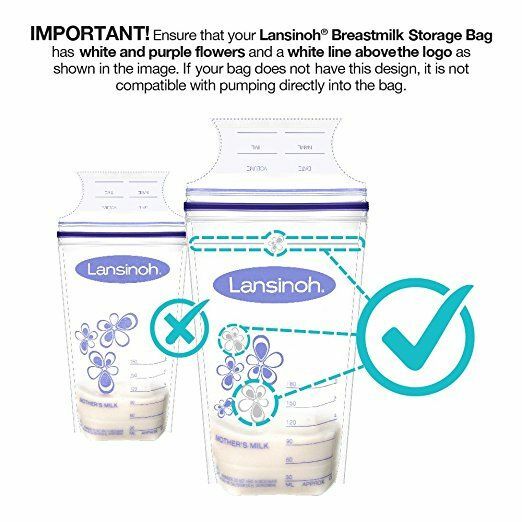 Wish they had kept that feature but again, not a deal breaker.​I used to switch between these and generic storage bags from a big bix store depending on price - but now pricing is very similar, so I choose to purchase these Lansinoh bags since the brand is focused on nursing moms. Also, feel like they use less plastic than the generic version. (based on density of the bag) I would recommend this brand of bags for nursing moms.Some tips:To transfer milk from bottles to the bags, I use the breast shield as a funnel after I pump.I freeze them flat and then "file" them upright in the freezer.I keep my pump, paper towels, hair tie and fine tip marker in my tote at all times for my pump sessions.If you have a back-up set of pump parts, leave some at the office or wherever you work. If you do forget a pump part, you can hand-express the milk out. It's a workout and not as efficient, but it helps when you're in a pinch.You don't have to wash your parts/bottles every time you pump. You can store them in a clean plastic bag or container in the fridge until the next session. I give them a full wash after a few days. In case you're curious about the max volume... 10-oz and the bag stays intact even after expansion upon freezing. (Yep there are bubbles in that pictured frozen 10-oz bag, my bad).I once tried 11 ounces but could not close the bag.I only freeze 10 oz portions from the morning pump when I have the most milk. In other words, I don't combine multiple pump sessions into one bag because the milk would be at different temperatures (imagine adding a cold egg into warm soup). One way around this is to bring morning milk and afternoon milk to the same temperature by chilling in the fridge, then, once both bottles are cold, transferring to a bag. I don't do that often because it's too painful to see chunks of creamy hindmilk left on the bottle once chilled. I used to store in 3-4 oz portion sizes (I'm still not sure how much baby needs to eat in one feeding since she's EBF) but why waste bags if I have enough more than one bottles' worth? Just defrost and pour into 2-3 bottles for daycare/babysitter.How I freeze and store:I place the fresh bag flat in a clear shoe box to freeze into a smooth shape while minimizing freezer smells. Once frozen, I store upright in gallon-sized ziplock bags. Nowadays this breastfeeding becomes an issue with the working mothers. They have to get back to their work shortly leaving the infant at home and the feeding schedule of the baby gets hampered by the working hours. Earlier, doctors tried to replace breast milk with other formulas or potions but feeding baby dairy products turned out unsuccessful and the baby didn’t show proper growth and development. In this circumstance, the invention of breast pump changed the whole scenario and mothers became able to extract their milk for later use. This very process is supported by breastmilk storage bags that keep the milk safe and healthy to be used later. Here we will talk about Lansinoh Storage Bags 100 that is a leading product in this field. Lansinoh Breastmilk Storage Bags helps in storing breast milk in healthiest and safest way possible. It meets all the basic requirements like the safe material or spill proof technology or proper size. You could use them for different purpose like storing or freezing. To buy this baby feeding product you need a clear view of the features and other details about the product. The bag is made of completely BPA free material that is very harmful to the babies and affects their immune system and growth. This assures you that the bag is completely safe for your baby and it is certified by the standard authority. Parenting: Is It Normal for A Baby to Vomit or Throw Up Mucus? Because of the material that it is made of, it is very pliable. There are double seal which you will find really helpful while pouring milk in or out. The bag has a strip on it that is used to open the bag conveniently. It can hold up to 6-ounce milk without any leakage. The spout is very convenient in comparison with other products available in the market. This doesn’t allows a single drop of milk to get wasted. You can easily attach this with any reputed breast pump and that will work perfectly fine. 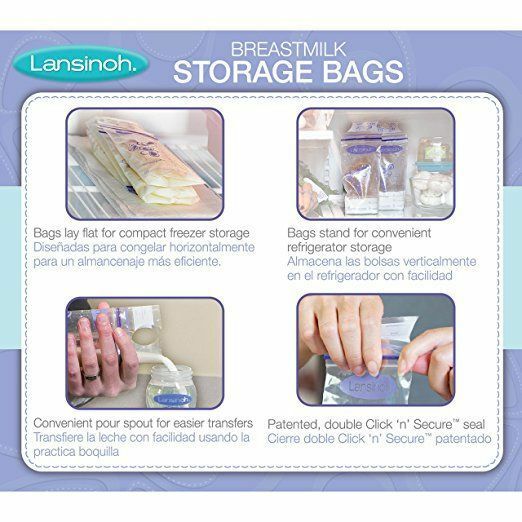 Lansinoh Breastmilk Storage Bags are used not only for storing the milk and for freezing and thawing as well. The bag doesn’t leak like other products while freezing the milk and doesn’t make the business messy. This makes your job easier and this is because of the double seal technique. The patented click is also worth mentioning. It would be wise not to use a bag twice. Although the quality is good when you use the bag for first time it is sterilized and the company does it with machines in some controlled atmosphere. You can’t get that back in room atmosphere and there is a chance of getting the milk contaminated. Then there is also other things to consider like freezing. After spending so many time in the freezer the bag won’t be in good shape and there is no chance you are taking any risk with your baby’s health. So it is recommended to use a new one every time the seal is broken. For a working mother, we can never ignore that importance of Lansinoh Storage Bags 100. She can fill the bag up anytime she wants according to her work schedule and the baby can have that at any suitable time. The material is completely safe and you can freeze the milk as well. It is an advantage to get going with the work and taking best care of the baby at the same time. There are various advantages of this product and there are some drawbacks as well. While buying this product we should make a quick glance. Spill proof and no leakage. Freezing and thawing get easier. The bag should be used only once. If the pump doesn’t get attached properly use some tape to make it stable. The main reason to choose this one over other baby feeding accessories products is better coverage and the quantity. It can hold a decent amount of milk that comes really handy for the working mother. The bag serves different purposes very efficiently and keeps the milk fresh and the mechanism is also easy for the mother. So if you are looking for any breastmilk store bag this product could be a smart choice. and see the difference. You can happily leave for work knowing your baby is getting the perfectly safe potion for best growth and development.